National Carrier of the State of Qatar now offers five weekly flights between Doha and Nice as it continues its rapid expansion plans. New route served by the Qatar Airways B787 Dreamliner provides passengers in the South of France connection to more than 150 global destinations. Qatar Airways is delighted to announce the launch of direct service between Doha and Nice, the airline’s second destination in France. Qatar Airways flight QR 53 operated by a Boeing B787 Dreamliner departed Hamad International Airport (HIA) on Tuesday at 7:45 (Doha Time) and arrived at Nice Côte d’Azur International Airport at 13:15 (Nice Time). Located on the magnificent French Riviera, Nice has a true cosmopolitan vibe with fashionable boutiques and restaurants, alongside magnificent beaches. The city is also the gateway to the South of France, including popular destinations such as Cannes, St. Tropez, Antibes and the region of Provence, while also being within easy reach of neighbouring Monaco and Northern Italy. The Qatar Airways delegation travelling on the inaugural flight, headed by Senior Vice President Qatar Airways Europe, Mr. Jonathan Harding, was welcomed by Chief Executive Officer of Nice Côte d’Azur International Airport, Mr. Dominique Thillaud; Chief Operating Officer of Nice Côte d’Azur International Airport, Mr. Didier Monges; President of the Tourism Commission of PACA Region, Mrs. Jennifer Salles Barbosa and City of Nice representative, Mr. Rudy Salles. Qatar Airways recently announced its partnership with the French Riviera’s premium helicopter operator Monacair, providing passengers arriving in Nice on board the newly-launched direct service the opportunity to seamlessly connect onto a Monacair helicopter flight to Monte Carlo. Likewise, passengers travelling from Monaco to Nice by helicopter will be able to connect at Nice Côte d’Azur International Airport to a choice of more than 150 destinations on Qatar Airways’ global network. The five weekly flights between HIA and Nice Côte d’Azur International Airport will be served by the Boeing B787 Dreamliner. The Qatar Airways B787 Dreamliner offers a two class configuration with 22 seats in Business Class that can be turned into fully-flat beds and configured in a 1–2–1 set-up, and 232 Economy seats in a 3–3–3 layout. The aircraft is also equipped with Oryx One in Flight entertainment system, offering more than 3,000 entertainment options including the latest blockbuster movies, TV box sets, music, games, and much more. Qatar Airways currently operates 21 weekly flights between Doha and Paris on board the airline’s ultra-modern fleet of Airbus A380 and A350. The airline also recently opened its luxurious, state-of-the-art Premium Lounge at Charles de Gaulle Airport in Paris. The National Carrier of the State of Qatar recently showcased for the first time its Boeing B777 fitted with the carrier’s award-winning new Business Class experience, Qsuite, at the Paris Air Show. Qsuite features the industry’s first-ever double bed available in Business Class, with privacy panels that stow away, allowing passengers in adjoining seats to create their own private room. Qatar Airways Cargo currently operates twice-weekly B777 freighters to Paris via Stansted, United Kingdom, in addition to transporting belly cargo on the airline’s three-time daily passenger flights to the capital city of France. The introduction of direct flights to Nice will offer 60 tonnes of weekly belly-hold capacity and take the total cargo capacity out of France to over 560 tonnes. Major exports from Nice include perfumes, flowers, vaccines and general cargo. Qatar Airways Cargo offers its global customers specialist solutions to transport all type of cargo via its state-of-the-art Doha hub. 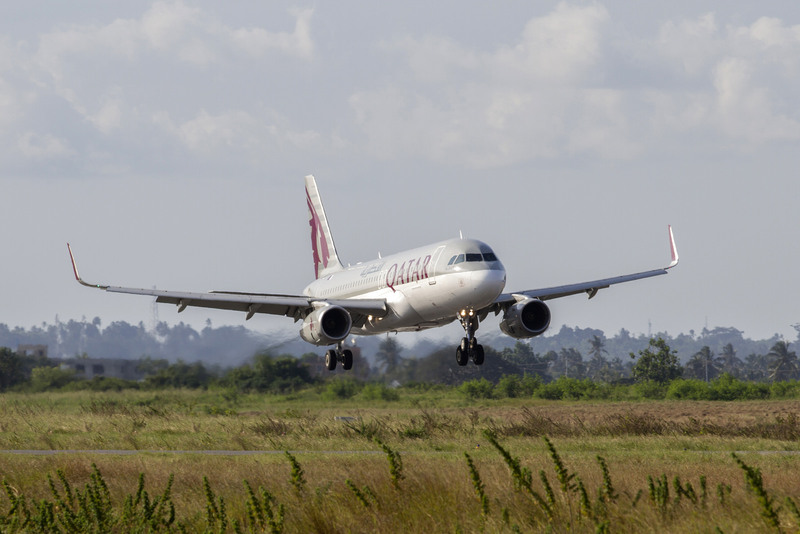 Qatar Airways is one of the fastest-growing airlines operating one of the youngest fleets in the world, with 200 aircraft flying to more than 150 key business and leisure destinations across six continents. The airline recently added Dublin, Republic of Ireland, to its global route network, soon to be followed by Skopje, Republic of Macedonia; Prague, Czech Republic; Sohar, Sultanate of Oman; and Kiev, Ukraine.